Developed by an Army officer who had two sons serving in World War I, the Blue Star Service Banner was a means by which a family could identify how many of its sons were serving in the armed forces. The 8.5" x 14" banner, first patented in 1917, consisted of a white rectangle with a heavy red border. Inside of the white area were blue stars (up to five), one for each family member in military service. The banners were widely used in the first and second world wars, but rarely used during the Korean and Vietnam conflicts. Since September 11th, 2001 the display of blue star service banners has been revived by the American Legion in order to honor American forces involved in defending the United States. These banners are sometimes mistakenly believed to indicate how many sons have been killed in combat. When a family member is killed a small gold star is superimosed over the blue star. 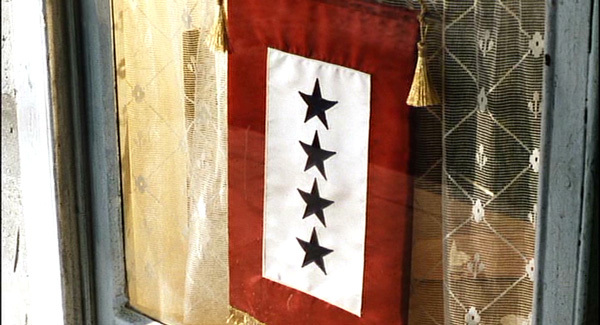 William and Margaret Ryan, the parents of James, Daniel, Peter and Sean Ryan, displayed a Blue Star Service Banner with four stars at their Payton, Iowa home in 1944.